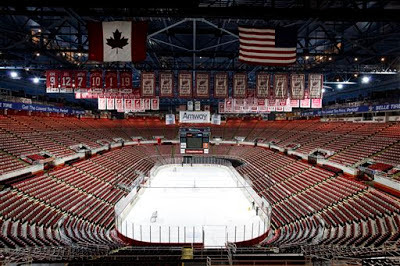 - While the arena is badly needed, and long overdue, it'd be naïve to believe Joe Louis Arena will not be missed. The memories there, which include four Stanley Cup championships, will long be treasured and Joe Louis Arena part of their lore. The building lacks restrooms, the corridors are far too narrow, the suites inadequate, the design about as up-to-date a 1970s Chevy Vega and it is downright ugly to view from the outside, but Joe Louis Arena does have its charm. There isn't a bad seat in the house. That, by the way, includes the press box. Sure, it was an afterthought and put at the last row of the arena, but it's still an excellent seat to view a hockey game. - Look. I am all for using some public funds, within reason, to help build stadiums and arenas for sports team. The idea this arena would only help make the Ilitch family even richer and serves no public good is ridiculous. First of all, Mike Ilitch risked a lot of personal finances to build Comerica Park, and it has paid off handsomely for the region. Same with Ford Field, which was originally supposed to cost $300 million, but the cost overruns (to $500 million), and most of the bill overall, was picked up by the Fords. But I can't help but wonder about the dynamics of this as it relates to the financial crisis in Detroit. The city owes a reported $15 billion in debt, yet there are all these sacred cows being raised. They can't touch the art at the DIA. They can't do anything with the Detroit Zoo. They somehow, somewhere have millions upon millions to help fund a new arena. Well, if everything is sacred, how does the bill get paid? That aspect doesn't fit into the realm of common sense and logic at the present time. - No, I don't think the Pistons should move Downtown. The Palace remains state of the art. It was privately build and carries no debt. It has been and remains a jewel for Oakland County.